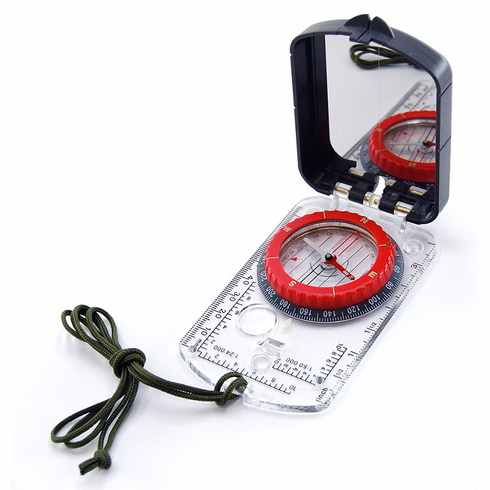 This professional full-size Sighting Mirror Compass includes all the features you would expect from your sighting compass. The sighting mirror features an etched centerline, top targeting vee-sight, and a small centered sighting hole. The bezel features 2 degree graduations and a top-side gear driven declination adjustment. (Declination adjustment tool included). The liquid filled capsule features a quick-dampening needle with luminous points, an integrated clinometer, map alignment lines, and a northern aligned boxed arrow for needle placement. The baseplate features an inch scale, cm/mm scale, magnifying lens, rubber feet, 1:24,000 map scale, and a 1:50,000 map scale. And each compass features a nylon cord neck lanyard. [Deluxe lanyard and compass case sold separately below].